Here we go into another winter. Yuck. Snow, rain, frost, and darkness. Wouldn't it be much better if we had something big to look forward to? Like a trip to Ascension Bay! We sure think so. Just tell your loved ones to get you Bonefish Flies instead of a logo fleece blanket and a golf towel for Christmas. We're here to save you. We have everything you need to plan the perfect trip to Ascension Bay. The goal of this article is to teach you EVERYTHING you need to know to have a successful trip to A Bay. Yes, its long but the first time I posted this article I had about 3 weeks of fishing Ascension Bay under my belt, now after another 5 trips I have a few things to add. The other thing that I would like to mention is that these perspectives are not just from my own angling, our company usually host about 50-60 anglers per year in Ascension Bay and we get a lot of feedback on what works for catching fish... and what works for having a fun and rewarding experience. Don't Be Intimidated... You're Going to Do Fine. I remember being intimidated even before I ever even saw my first Bonefish. I totally psyched myself out. What if I can't see the fish? What if I can't cast far enough? What if I don't catch as many fish as I like? Will I get sick? Can I drink the water? Is it safe? I think questions like this prevent way too many anglers from signing on for this trip. If you are traveling with Red's you can relax. Its a vacation not an elephant hunt so don't stress. I didn't grow up doing any traveling, so I will be frank is saying I had a lot of anxiety based on trip cost vs. trip value. This trip isn't horribly expensive, but for me it was a huge investment prior to becoming a travel host. After about the first 2 hours all of this anxiety was gone. I washed it away with cervezas ha! Maybe I was worried about the water. The fact is all those silly questions, and worries you might have are a total non issue. You are going to have a great time no matter what. And guess what? You will be able to cast far enough to catch some fish, and if your expectations are at all realistic you will catch plenty of Bonefish. The other species are a bit more challenging, but as far as just getting some hookups and having a great time goes all you need to do is show up. It seems to me that most flats anglers like to spin tall tales about their 80? casts into the wind they are constantly having to make (and making!) to catch flats fish. It is pretty annoying quite honestly. It sure makes for a good story though and the casts get longer as they make it back into the states. A foot per 100 miles is about the right ratio from my experience. By the time somebody gets from Cancun to Seattle that is one long cast! It started as a 40? cast? with a light breeze. Fishing and casting in the flats is really no different than fishing anywhere else. The better caster you are, the more fish you will catch. This is true no matter where you go so don?t be scared by flats fishing. LOTS of Bonefish are caught at very reasonable casting distances. Sometimes as close as 10-20?. A typical cast is 40? ? 50?. With an 8 weight and a floating line this isn?t too hard. If you want to target trophy fish like Permit, Tarpon, Snook, and larger Barracuda I suggest you invest as much time into learning a strong, tight looped distance cast as possible however. If you are like me, I dreamed about going on my first flats trip my whole life but it was always out of reach. It wasn?t until a few guide pals of ours in Montana put us onto a great little place that was actually affordable that my first flats trip became reality. The Montana boys said something like, ?dude you have got to do this! Just squirrel away some cash and go fish your brains out for a week? cheap!?. These guys are pro guides, true pros, and they knew the difference between a good operation and anything less. We took their word for it and jumped on a plane! It exceeded every expectation I had ever had. Before my first flats trip I didn?t have a clue about what kind of fish I might find. I didn?t know the names, behaviors, or what flies to use. I didn?t know what type of food Bonefish eat or what a ?shock? tippet was all about. I thought a Permit was just a fishing license (it?s a fish? THE FISH), but more on that later. The point is, you don?t have to know much about flats fishing to get signed up and get your trip planned. Some helpful advice goes a long ways and we hope this introduction to flats fishing gives you the intel you need to help plan your trip. Or at least be able to talk about it over a few beers with your buddies that flats fish without feeling left out. Ascension Bay is on the Caribbean side of Mexico about 100 miles south of Cancun. This is the Cooperstown of flats fishing. It has been written about in every fly fishing publication on earth. The diversity is fantastic, it is easy to get to, and the whole experience is beautiful both in the water and out. It is the place where names like Brian O?keefe, Jack Nicklaus, and other celebrities spend their fishing time. It is a world wide destination. It is only a day?s travel yet a large percentage of the anglers that fish here are from Europe. How Many Anglers do You See? Not many. The ocean is a big place and there is lots of room for everyone. You will rarely fish within sight of another boat and when you do it is off in the distance. For a world class destination the flats of Ascension Bay are practically empty. What Kind of Fish are in Ascension Bay? This was the most overwhelming thing to me. I had no idea what fish lived in what type of water and how you might go about fishing for each one. This was the ?black hole? of intel on my end and was just scary enough that I wasn?t confident enough to get on an airplane and fish for something I didn?t have a clue about! Probably not unlike you. Let?s make sense of all these strange looking fish. Here is a list of the common fish that we catch here. There are lots of other stuff like Snapper, Tripple Tail, Blue Runner, and some less common fish. How Do You Get to Ascension Bay? There are a couple of options here, but most folks travel the same way our crew does. Red's coordinates a nice van service to pick up our group at the airport and we all ride together even if we come in on different flights. We always fish out of the town of Punta Allen, and its famous for its limited access and rough road. Its a fly fishing hot spot and eco tour destination. The limited access keeps the town quiet and the last census showed 469 folks living there. Small town, dirt roads, and no cell service or communication. There is internet but it is very spotty and limited. There is one lodge in the south of Ascension Bay that you can fly to in a small plane from Cancun, but most folks take the drive. It takes about 4 hours to get from Cancun to Punta Allen and the last 2.5 hours is on a rough road driving down a small Penninsula with water on both sides. What is a Day of Fishing Like in Ascension Bay? In Ascension, we fish with guides that you use 23? Panga boats because we will have a 1:1 guide to angler ratio with 2 guides per 2 guests. This is a GREAT service. I strongly encourage anyone fishing Ascension Bay, especially new flats anglers to be absolutely sure you are on a 1:1 angler to guide program. The advantage is huge. The Panga boats have an outboard motor, high bow in the front to knock down waves in the open water, but draft in very shallow water as well. The guides have an elevated poling deck in the back and a nice casting deck in the front for the point angler. There are a couple of lodges that use "Flats Boats". A flats boat is smaller and operate with a 2 guests to 1 guide ratio. Some advanced saltwater fisherman prefer this, I however like the 1:1 because it allows you more mobility if one angler/guide want to get out of the boat and stalk fish on foot. A typical day starts with breakfast at the lodge at 7:15 am, and the guides will be coming in and out packing coolers and getting their assignments. Our crew is guide ready at 8 am and we're back at the lodge at about 4:30 pm or so. You'll fish from the boat most of the time doing what I like to call "patrol". The guides will pole along their favorite flats looking for whatever the target species happens to be. Much of the time they are looking for everything! Tarpon and Snook are largely confined the the many Mangrove Lagoons found in Ascension Bay, but Permit, Tarpon, Barracuda, and Jack Crevalle are all found in open water. We often see Snook in the open water when the tide is low too. You just never know what you might cast at. I have cast at 5 species in less than 15 minutes before! Ask the guide to carry an extra rod - I ALWAYS carry my Bonefish rod in hand, but I keep a Crab Pattern in my hat in case we spot a Permit. Although my leader won't be quite as heavy as I like, it will suffice in a pinch. I have the guide carry my 10 weight for Barracuda set up with a wire leader every time I leave the boat. Learn to manage your line in a way that you can cast quick. Here is a video tip for a technique that I learned when fishing on Christmas Island. Talk to the guide. It just you guys 1:1, its a great time to ask questions and learn. You can slow down and get some great education. Ask the guide to carry your camera. When its dark and cloudy walk slow! Walk quietly, and learn not to splash your feet. Watch your guide and see how quietly they step. Remember, you are stalking PREY. Lighter flies when wading are a good idea. You are likely to get multiple shots into a school without the big scary boat there to spook them. A heavy fly is good for one shot out of the boat in deeper water. In the shallows a lightweight fly that you can place into a school is a big advantage. Each day our hosts will rotate anglers that don't have a designated partner. If you travel as a single angler expect to be paired up on a rotation with another angler in the group. I know lots of guys are nervous about sharing the bow time with somebody they don't know, or maybe with someone they do know haha! Either way, sharing the boat is fun and there are some techniques to balancing the action so that everyone is happy. First off, if you are after Bonefish and its your first day or you haven't got as much action as you hoped for ask the guide (or the Red's travel host) to set you up with a guide or partner that would like to do some wading. This is underutilized as far as I am concerned. Not enough anglers request to wade fish. If you aren't going to wade fish you'll want to lay out some strategies with your fishing partner to maximize productivity and keep both guys interested. Personally, when we are on the open flats I don't mind batting "clean up" versus being the guy "on the deck". The reason is you never know what species might pop up. If you are on deck you can only hold one rod in your hand right? Well, if you have your Bonefish rod and a big Barracuda is spotted guess what? Yep, I am batting clean-up with a big ol' 10 weight. This also keeps me interested. I stand up on top of a seat or cooler and scan like a human radar all day, every day because I'm always in the game. I just lay out some ground rules with my fishing partner at the beginning of the day and work out the details. If a fish that requires a different fly or leader system pops up the Clean Up guy gets the shot. You can switch at any time but this is a good agreement lay out at the beginning of the fishing day. This system works well when you are on general "Patrol" on the flats but if you are specifically targeting Permit in the deeper water there is little chance you will see other fish species. In this circumstance you can do 20 minute rotations, or simply swap out after each legitimate shot. Fatigue of standing up there on the deck also plays a factor and most guys won't want to stand up on the deck very long anyways. In the Mangroves when you are pursuing Tarpon and Snook, you'll want to trade out spots regularly and be generous about sharing the bow time. Work it out with your fishing partner. I like trading after each hook-up or if you snag in a branch! I hate fishing with guys that snag the Mangroves every 2 minutes. Don't be a snagger. All in all, there are ways to share the casting deck and keep everyone happy. Chances are you'll get just as excited when your fishing partner is casting as when you are. Also, watching is good! You learn more by watching because you aren't emotionally attached to the situation and can be objective. What fly rods to bring to Ascension Bay? If you had to only bring one it would be a high quality 8 Weight, 9' long with a tropical floating line. The more times you fish Ascension Bay however, the more rods you tend to pack. The reason is that various species pop up very fast and don't let you know they are coming. Each fish requires a very different leader setup and in order to make your trip as productive as it can be you'll want a few rods. Here is a list of what the "Well Prepared" Angler might bring if budget wasn't an issue. This is what I pack for rods with a few notes. These rods are all in the boat with my EVERY DAY and rigged with different flies/leaders so that I can almost instantly cast at any species. 890-4 - I like an 8 weight as my Bonefish Rod. You can get away with a 6-7 weight if the wind isn't too heavy. Just keep in mind it is very one dimensional as you wouldn't want to throw it anything but Bonefish. When I am walking for Bonefish and a 20 pound Permit swims by I like to at least give myself a chance! 8710-4 - This is my Mangrove rod. I like a 7'10" Redington Predator Rod or Sage BASS II Largemouth Rod for all my Snook and Tarpon work in the Mangroves. Its short, quick, and I can deliver a fly on a dime quickly under almost any branch imaginable. I have it rigged with a Snook Leader (40# Shock Tippet) at all times. These rods are crowd favorites. Every time I loan them out in Ascension Bay its hard to get them back! It also doubles as my Largemouth Bass rod back home. 1090-4 - This is usually rigged with wire leader for Barracuda, but I'll use a 10 weight for Tarpon in the open water (its tough to land anything over 25 pounds on an 8 weight). I'll also use this rod for sharks if we decide to get dirty. I like to have a 10 weight in the boat at all times. If you are fishing in a "pair" with the same partner all week this rod can often be shared. 890-4 - I like to have another 8 weight or 9 weight rigged for Permit at all times. You don't want to miss a shot because your "go-to" rod is rigged with a Bonefish or Snook Leader. Permit will come out of no-where sometimes and I want a good crab fly and a fresh 15-16 pound tapered leader ready to throw at the blink of an eye. The reality here is most of you won't bring 4 rods/reels down to the flats. You absolutely have to have a go-to 8 weight rod that you enjoy casting and can count on. You can re-rig it for Snook and handle most Tarpon on it that you'll see. If a guy had an 8 weight and a 9 weight as his "Barracuda" Rod or backup rod that would be a pretty good combo. I implore you however to bring 3-4 top quality setups. You'll use 'em and if you don't have them you'll have wished you did. I know of no other place in the world where the game can change as fast as Ascension Bay. You'll want good reels, but since we aren't targeting "big" saltwater fish like Giant Trevally, Big Tarpon, Sailfish, Marlin, or even big Dorado or Rooster fish I won't pretend that you absolutely have to have a top tier fly reel. That said however, the top brands like Nautilus, Hatch, and the high end Sage fly reels will give you an advantage AND will hold up to many years of use. There are lots of good reels out there. We sell the brands listed above. For a super lightweight Bonefish reel Lamson Litespeed is hard to beat. You'll be able to count on these reel for years after they are plunged into Saltwater again, and again, and again. As far as backing goes, 30# backing on your Permit rod and the 10 weight are adequate. For Bonefish 20# backing is just fine because your tippet will rarely be more than 15# test on this rod. Most fly reels that are decent quality will function just fine but just know that anything that isn't designed for saltwater will get some corrosion. It won't show up right away, but it is there and will eat up your reel. Just sayin. Here is a photo of a freshwater reel that was used in Saltwater. It also was not rinsed properly after use, but you can see what happens. I love Bonefish. They are the heart and soul of flats fishing. They might not be the biggest fish but they are the ultimate quarry for a fly fisherman. If you want some more incite specifically on Bonefish, be sure to read this article that I wrote a couple of years back. A Passion for Bonefish. Also, please check out this video from a couple of trips ago. More anglers get on a plane to go catch Bonefish than any other species. They are aggressive, it is pretty much all sight casting, and they fight like crazy. They are caught in the most abundant numbers, and likely what you will spend most of your time pursuing? if you are smart. Average size is about 2+ pounds and they run like crazy! Fish to 5 pounds are not uncommon here. Ascension Bay is know for good numbers of Bonefish, essentially a quantity over quality ratio. Plenty of fish. Bonefish love shallow water and when the fishing is good they will have their tails exposed, hence the term ?Tailing Bonefish? which is every flats anglers weak spot. We all love tailing Bones. One of the videos below has some great footage of tailing Bonefish in case you haven't ever seen that before. They eat shrimp, small crabs, and other crustaceans. They travel in very shallow water and the juveniles (12-18?) will run in schools, and the larger fish (3-7 pounds) will usually travel in pairs or groups of three. 7-8 weight rods, 2X Fluorocarbon Tippet and soft casts catch the most Bonefish. Flies should be very lightly weighted with bead chain eyes or similar. Heavy flies tend to scare fish. This is the most coveted game fish in Ascension Bay ? or so says anybody that has ever stalked the flats searching for them! Ascension Bay is one the top, if not THE TOP Permit destination in the world. Cuba is likely better, but not as accessible. Especially for a guy that doesn't have $6,000 to spend on a week of fishing. There are more than 1,000,000 Permit living in Ascension Bay. Anglers make many trips without landing a Permit but don?t let that intimidate you. Many anglers traveling with Red?s have caught Permit on their first ever flats trip. Some of you flats anglers just got nauseas. Sorry, life?s not fair. Spooky, fast, wiley, and selective are words that describe them. Mystical, captivating, and addicting do too. They eat primarily crabs so you should have at least a dozen various crab patterns with you. Long delicate casts, longer strips, and quiet ?tip toe? feet are required. The guides in Mexico like to say? Bonefish are fun, but Permit is our drug! When they are ?tailing? (tail out of the water, head down feeding) is when you try to time your cast. Be prepared to get out of the boat in water that is thigh to waist deep to stalk these fish. They prefer water that is 2 ? 5? deep. They can be very frustrating. Currently, I have thrown about 65 near perfect casts at Permit without a single hook up. I have put it on their nose, had them swim into my tippet, follow my fly a couple dozen times, peck at my fly, but I CAN'T SEEM TO GET ONE. To this point I have personally only landed 5 Permit which were all in my first two trips. I am 6 trips without a fish to hand. Anyone that knows me knows that I fish VERY HARD. I never stop looking, no rests, no breaks, and my casting is about as good as anyone out there. Which leads me to this conclusion. Permit aren't fair. Its as simple as that. I have seen about 10 anglers that I practically taught to cast land their first Permit during my dry spell! Maybe I'm bitter, but these fish have my number. It just makes me want it that much more. Here is a picture of my very first Permit from 2010. I'm still living in the past. Its ridiculous. When it comes to Permit, you will likely be pursuing them in slightly deeper water and either casting from the boat or bailing overboard into waste deep water to hunt them on foot. Oh man that's a rush. High stakes fishing for the big boys. I love it even though I have been sucking at it lately. You'll fish crab patterns on 15# leader and you'll need to make one good shot. They are very spooky so don't press the fish too much... but you also have to play to win. Here are some tips. I have read a lot about Permit fishing, had lots of water time myself, and learned a ton by asking many different guides lots of questions. Generally the big Permit in Ascension will travel in singles and the smaller fish will be in schools. They are the fastest and best fighting fish in A Bay. The biggest Permit landed in our company was about 30 pounds and took one hour and 45 minutes to land! Permit range in size from 4 ? 40 pounds. Here are a few tips. Stay calm. If you are going to get this done keep a cool head. If you need to re-cast, make sure to strip most all of your line back in. A back-cast that starts with too much line in the water is a disaster. Take a strip of line in to remove slack immediately after your fly hits. Long sllllooooow strips. Many flats anglers believe that you can't strip a fly and catch a Permit. While I have great respect for Lefty Kreh and Del Brown they fish the Florida Keys not here. All the Ascension Bay guides believe in stripping the fly. Therefore on this trip I believe they fly should be stripped. Don't hesitate between strips. Try to get your stripping hand back up for the next strip instantly. Don't wait to feel the fish to set the hook. This is my biggest error. I have missed a dozen because I am too much of a chicken to set the hook. If the guide says SET then set. The fish will eat and create a bit of slack so you won't feel it right away most of the time. Ask the guide which way the fish is pointed. A lot of times if the fish is meandering you won't know which side to cast at. Better to spook the fish and be in the game than to cast too far away. Play to win. Aim 6' in front of a cruising fish, 24" or less on a tailing fish. Have your shoes on when you are on the deck. No time to get your shoes on if a Permit is spotted. 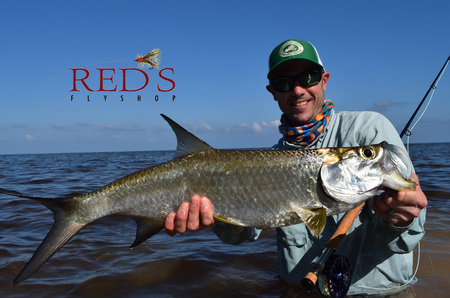 Fish Permit on calm days, Bonefish or Tarpon on cloudy days. I said this already, but have a dedicated rod that is always ready for Permit. Don't handle your fly with sunscreen on your fingers. When you cast, bring your rod tip all the way down to the water (not a hard stop), this will help the weighted fly unfurl at the end of the line and land a bit softer. Recommended Rods: 8-10 Weights, 9' Fast Action, I like the 7'10" 8 weight Redington Predator. IF you are using an 8 weight it should be built for handling saltwater fish. Recommended Lines: RIO General Purpose Tropical, or Airflo Bruce Chard Tropical Punch. Shooting heads are tough to handle in the Mangroves, they are ok in the open water like the Florida Keys but handling them in the bushes makes it hard to keep your fly out of the brush and measure your cast. The Tarpon in Ascension are found most abundantly in the Mangroves and will be juveniles 5-40 pounds. Not bad eh? We have cast at fish in the 60 ? 100 pound range but don?t come expecting monster Tarpon. In the more open water there are occasions when fish up to 100 pounds are possible but our entire focus is on ?Baby Tarpon?. Tarpon eat flies near the surface and it is the equivalent of a dry fly take as your fly is only INCHES under the surface! It is a rush like you won?t even believe. They attack from underneath and hammer your fly. We do find schools of Tarpon in deeper water out in the open and this where you'll to exercise some long casts. You'll want a 10 weight rod and a shooting head for this "open water" fishing. Much of it will be blind casting and quite challenging. A weighted fly is nice to have in this situation. A big Shrimp pattern like the Puglisi Mantis Shrimp is good for Tarpon running a bit deeper in open water. Tarpon are famous for jumping like crazy and you should ?bow? your rod to the fish as they jump. They eat varieties of baitfish primarily but will eat crustaceans at times too. A 9 weight rod with a 60 lb. shock tippet to protect against their sharp mouth is a great setup. A quality 8 weight will work but since you are dabbling with fish that can push 25 pounds commonly a heavier rod is wise. I personally like a short saltwater specific rod as my first choice in the Mangroves. The Redington Predator 7'10" 8 weight is like a little crowbar. I love it. Tough, stout, and I can place it under the Mangroves. It gets a tight loop under the wind so its not bad in the open water. Another affordable option is the Echo 3 S - Saltwater Rod. If you plan to use an 8 or a 9 weight rod, it should be a saltwater specific rod if you want to land fish over 20-30 pounds. Sure your Steelhead rod will handle the 5-15 pound fish but when you hook into a fish like in the video below you'll want a tough 9-10 weight Saltwater rod. The Sage SALT is the best rod out there for situations like this (if you don't want to go with the little guy at 7'10". The Sage MOTIVE is also a great choice. The 990-4 Sage MOTIVE would handle pretty much any Tarpon you could hope to hook in A Bay. Tarpon don't require long casts in the Mangroves and Canals. They do require accuracy because with all the food and baitfish found in these canals they aren't going to swim far out of their way to take a fly. Plus if you snag Mangroves your fly won't come out usually. You'll break rods trying to free your fly, keep in mind you are using 60# tippet. When you snag the outcome is that you'll have to pole the boat in and retrieve the fly. The hook set matters most. Set the hook 4 times as hard as you think you can! Then double that. Lean forward with your feet all the way on the edge of the boat, this will allow for a stronger hook set and get low so that you can back up and stand up increasing your setting power. Keep your tip down on the set and during the fight. KEEP STRIPPING! These fish will swipe at the fly, miss it, bite it and get stung, bite again, and keep chasing. Keep stripping until that fish is hooked. Don't give up, I have hooked Tarpon with my leader inside my rod tip! I don't mind fishing Tarpon on cloudy days, if its a dark sky Tarpon aren't bad to target because you may see them rolling and be able to blind cast. Just my 2 cents worth. Recommended Rods: 9-10 Weights, 9' Fast Action, I like a 10 Weight especially for throwing poppers. You can also use the 7'10" 8 weight Redington Predator or Sage Bass II Largemouth Rod if you are an experienced caster. Recommended Lines: RIO General Purpose Tropical, or Airflo Bruce Chard Tropical Punch. If you are novice level caster, a RIO Outbound Tropical Short Shooting Head is the best. Barracuda live in open water and you won't be having to cast towards bushes most of the time. It also helps make a very quick cast with big flies. This is the predator fish of the flats and perhaps the most underrated of all flats gamefish. They are like a Pike on steroids. Usually we don?t target Cuda but treat them as an ancillary catch as they roam the flats and pop up all over the place. You will see Cuda everyday on the flats here. A good strategy in each boat is to have a rod rigged up and ready to go. If one angler is on the casting deck ready for another species, the angler waiting should have a Cuda rod ready to go at a second?s notice. They are something that we catch opportunistically. Average Cuda are 3? long, and big ones are about 5 feet long! They attack Poppers, Needlefish, Gurglers, and other large baitfish. Sometimes it takes several casts with super fast stripping to entice them, but once they attack? HANG ON! It can be violent. They run, jump, and slash like you wouldn?t believe. Wire leaders, 10 weight rods, and big flies are the trick. They have teeth like you wouldn?t believe which requires a wire leader. Be the "Clean-up Batter" - If your buddy is on the casting deck, be ready with your Cuda rod AT ALL TIMES if you really want to get one. They don't tolerate the boat very well so you may only have a few seconds to get that fly in front of it. Strip FAST and don't stop unless the guide tells you to. Get out of the boat. If you are physically able to get out of the boat fast, and stalk the fish on foot this really helps. You can always get back into the boat to land it for safety from those nasty teeth. The guides won't usually suggest this so you may need to force your hand. I do. Strip strip strip. Don't stop until you have it hooked up and KEEP YOUR TIP DOWN. Do not lift that rod tip until you have that fish on on on. They will hit the fly several times attempting to wound and shred their prey. If you are fishing me or Steve Joyce we will whack you in the head if you lift your rod tip and take it away from them. Change flies! If a Cuda doesn't take my fly after 3 attempts yet hangs out. I change immediately to a Popper from a Needlefish or vice versa. Bring a glove, handling your own catch is a right of passage. Recommended Rods: 8 Weight, 9' Med-Fast to Fast Action, I like the 7'10" 8 weight Redington Predator or Sage Bass II Largemouth Rod. Recommended Lines: RIO General Purpose Tropical, or Airflo Bruce Chard Tropical Punch. These are really cool fish! The creatures of the Mangroves? Snook tend to hide up under the Mangroves only wandering out a fin at a time! It is a fun casting game trying to get your fly up under the Mangroves just right. They eat baitfish and you can think of them like largemouth Bass and attack flies hard once they decide to hit! The primary flies we like are un-weighted Deceivers. Most Snook are about 5-10 pounds, although one of us did hook one closer to 20 pounds last year! The world record is 53 pounds, and you will see photos at the lodge in Ascension of Snook over 30 pounds! 8 weight rods with 40 pound shock tippet is the right setup. Similar to Tarpon, you can use the same rod, leader, and even fly (in a pinch) for both Tarpon and Snook. The Snook however do seem to be more tippet shy and I have found 40# to generate more strikes. Look for alleys or gaps that allow you to shoot your fly under the Mangroves, this allows you to "get ahead" of a slow cruising Snook that is inside the canopy. Don't hang up in the brush unless you want to get pushed out of the boat by your partner. Ask the guide about tides, if its a low tide this can be INCREDIBLE Snook fishing! High tides are usually bad for Snook because they go up inside the brush. Look for parts of the fish when we are fishing the brush. Learn to "skip cast". Practice in advance. Those who learn this will put more Snook in the boat. Be a robot for the guide, "strip, STOP, strip, strip, strip... STOP". These guys know these fish and can actually read the body language of the Snook. Leader Required: Any of your leaders will work, chances are whatever rod you have in your hand when the Jacks show up is what you will be casting. Recommended Rods: 8 Weight Fast Action, would be the most idea. Jacks are like freaking hornets, they swarm across the flats like a squadron! They are very fast adn the big Jacks will be up to about 25 pounds and are among the hardest pulling fish in the world. Lefty Kreh says in his book on Saltwater Fly Fishing that they may be the hardest fighting fish in the flats. We don?t catch a ton of Jacks but they are there and you will get some shots in a week at Ascension. Get in a school and you will never forget it! Jacks roam the flats wandering in from the shoal once in a while. They are a fast cruiser and very aggressive feeders. They take a variety of flies willingly and when the conditions are windy and the water has poor visibility some guides will take you to the shoal and blind cast for Jacks with Clouser Minnows and/or Poppers. Jacks fight well and average 5-10 pounds most of the time, but we have had guests catch Jacks closer to 20 pounds. An incredible fighter! Jacks are VERY strong. A standard 0X Fluorocarbon Tippet is perfect for Jacks, the same leader and setup you use for Permit will work for Jacks and as long as the fly gets close they will eat a crab pattern most of the time in the flats. On the shoals, bigger flies like baitfish and poppers are required to get their attention since you are blind casting. Be quick, you won't have time for a bunch of fancy casting. Casts will range from 15' to 80'. Practice your casting because you may have to track down some fast movers. I personally prefer to cast when the fish are out as far as possible because they might follow for up to 30' smacking your fly and trying to disorient it like they do real prey. Fast strips are typically best. On a cloudy day, ask the guide to take you to a "blue hole" to blind cast. You'll catch lots of small Jacks and you can do it on Poppers which is great fun. Each species requires slightly different flies. There is so much variety in Ascension Bay which requires the angler to pack a fairly deep fly box. Your host will have some backup flies if you fish with Red's, but part of what makes these trips affordable is that you will provide your own flies. This is the best way. The guides have a few flies, but their remote location limits their access to tying materials and flies. If you want to make their week, give them a big bag of tying materials. A good fly assortment will put you in the game for all the species regardless of lighting, tides, or time of year. It is impossible to have everything, but this assortment covers all the bases and you will be well prepared. DISCLAIMER: I am not responsible if I forgot something on this list. I am not your mom so I didn't list things like underwear. Packing for a big trip like this takes some work but I think we have it pretty dialed in for you here. If you are traveling with a Red's group and forget something, don't stress! Your host will make sure that you have what you need to get started. You will go barefoot in the boat most of the time, the boats are clean and nothing sharp to step on. You can feel your line under your feet if you step on it, and its just more comfortable. If you are fishing for Permit, its good to slip your boots on while you are up on the deck so that you can get in the water immediately when a fish is spotted. The best all around footwear for Ascension Bay that I have found is the Simms Zip-it II Booty. These fit very snug, go ahead and buy your shoe size but if you are "half sizer" go up a size. I wear these directly over my barefeet. Very comfortable. The nice thing is that you can get them on and off quick. You can get away with a good water sandal, but its not recommended. You'll get shells, mud, and sharp stuff in your sandals. Guys do it and get away with it but comfortable feet are priceless. You don't absolutely have to buy or aquire everything on this list. I've seen a few guys bring one rod and fish in sandals all week and do fine. Personally that's not my style, these are important trips and I seek to make the most out of every minute of my fishing day. Plus you might wind up with some unforeseen circumstances. Preparation never hurts! Wateproof Hip Pack or Fanny Pack (designed for saltwater so that it can be rinsed clean) I personally like a waterproof backpack like the Simms Z Back Pack so that I can use it as my carry on bag on the plane too. This January will be my 8th trip to Ascension Bay with Red's Fly Shop. Obviously I love this trip. This is an awesome article reviewing this trip. If anyone reading this is wondering if they will love this trip I will just say that it changed my plans for the rest of my life. Thanks for the great review with all the info anyone needs to be prepared for a wonderful, life changing adventure. Great effort Joe! Thanks Mike, that is a good way of saying it. "it changed my plans for the rest of my life" haha. Its true. Everything else gets planned around this trip now doesn't it? Excellent write-up! Thanks for a really comprehensive overview. Im headed down next month just for a day trip while in the area. I hope to get on one of these week long trips with Reds but this should get me at least some exposure. Great and very helpful write up. I feel much more prepared reviewing it! We have a group of three anglers and wives (non fishers) going to Ascension Bay in April. Any suggestions for lodging? What is the best time of the year to catch bonefish and tarpon on the fly in Ascension Bay?